ValePro offer a new header layout, in addition to the default five header layouts, already available on SuevaFree. 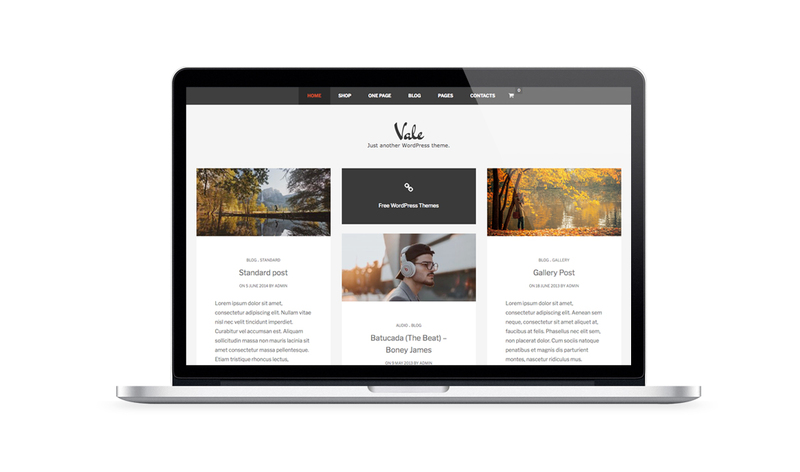 When you create a new page using the one page template, ValePro will add automatically a unique sidebar area and menu location for this one page. Included on ValePro, a new widget called ValePro Biography Widget. Included on ValePro, a new grid layout with a left or right sidebar for the homepage, categories page and search result pages. For any question and problem, you can request a quickly support, is necessary open a new ticket. Load our sample data from WordPress importer, with all pages, articles, menu and portfolio items. How i can purchase the theme? You can purchase the theme using PayPal. It is not necessary to have an account, just a credit or debit card to process the payment with. How i can download and install the theme? Your order details and instructions for downloading the theme will be sent to the same email address that was used when making the purchase through PayPal. I bought the theme but i did not receive any email. Can i use your themes for a commercial project? Absolutely, yes! You are welcome to use our themes for commercial projects. Can i change the language of the theme? Yes. We recommend the free application ‘Poedit’ for translating the theme. Requests can be include general queries, bug reports and even little customisations of the theme. We also provide the additional flexibility of adding new features or more advanced customisations to the theme, priced at an hourly rate depending on the request. ValePro WordPress theme is not subject to the GDPR as it does not processes and store any personal data of your visitors.